Website Speed Test for UX: Speed Index, Start Render, etc. How fast is your page displayed loading on a mobile connection? 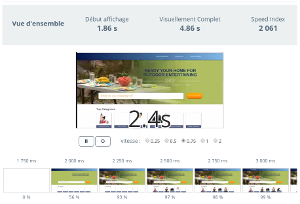 Test the user performance thanks to our video analysis. Why you should test the performance from a user perspective? Server response time, page’s weight or number of requests are significant technical metrics. But how these loading times affect the way your page is displayed for your users? The duration before the display of the page or even the time before the full display of the content located above the fold (available without having to scroll) are key milestones for the user experience. Know these metrics to ensure the best user experience, and compare yourself to your competitors in terms of experience rather than with technical criteria only. Allowing you to set advanced settings (bandwidth, screen resolution, location, etc.) our tool allows you to accurately reproduce a visitor, and replay a video of the page display. Dareboost retrieve the major metrics for you (the beginning of the display, full display, etc. ), adding technical indicators and dozens of tips to optimize your website for speed.